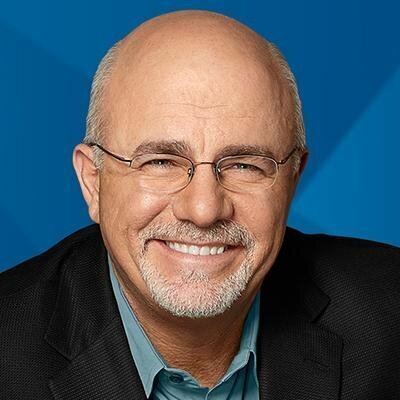 David L. "Dave" Ramsey III (born September 3, 1960) is an American businessman, author, radio host, television personality, and motivational speaker. Ramsey's syndicated radio program, The Dave Ramsey Show, is heard on more than 500 radio stations throughout the United States and Canada, in podcast format, on IHeartRadio, the Dave Ramsey Show iOS application, live on YouTube, as well as live audio and video on DaveRamsey.com. He has written numerous books including five New York Times bestsellers. His books and broadcasts advocate a fiscally disciplined approach to personal and household finances, including the strict management of debt, and often feature a Christian perspective that reflects Ramsey's religious beliefs. Ramsey was named the 2009 Marconi Award winner for Network/Syndicated Personality of the Year, and was inducted into the National Radio Hall of Fame in 2015. Ramsey has been featured on many media outlets including The Oprah Winfrey Show, 60 Minutes, and The Early Show. He recorded a pilot and six unaired episodes of The Dave Ramsey Project for CBS. He was the host of the television program The Dave Ramsey Show, which aired on the Fox Business Network until June 2010. Ramsey was born and raised in Antioch, Tennessee. He was a 1982 graduate of the College of Business Administration at University of Tennessee, Knoxville with a degree in Finance and Real Estate. At the age of 26, through his brokerage firm Ramsey Investments, Inc., he built a rental real estate portfolio worth more than $4 million and became one of Tennessee's youngest brokers to be admitted to the Graduate Realtors Institute. Ramsey's success soon came to an end as the Tax Reform Act of 1986 began to have a negative impact on the real estate business. One of Ramsey's largest creditors was sold to a larger bank, which began to take a harder look at Ramsey's borrowing habits. The bank demanded he pay $1.2 million worth of short-term notes within 90 days, forcing him to file for bankruptcy relief. Sixty days later another bank demanded nearly $800,000. After recovering financially, Ramsey began counseling couples at his local church. Soon after offering private counseling services, Ramsey began attending every workshop and seminar on consumer financial problems that he could find. He developed a simple set of lessons and materials based partially on his own experience and on works and teachings by Larry Burkett, Ron Blue and Art Williams of A.L. Williams company now called Primerica. In 1992, after many requests from his clients, he wrote his first book, Financial Peace. Ramsey is a devout Christian. Ramsey has been married to his wife, Sharon, for over 30 years. They have three children: Denise, Rachel, and Daniel. The family resides in Winchester, Tennessee. Twenty-five years ago, Ramsey started his radio career by co-hosting the show The Money Game with Roy Matlock of Primerica. Over time, that local show on one radio station in Nashville turned into The Dave Ramsey Show. With a combined listenership of over 12 million weekly, the show is available on more than 575 radio stations, a dedicated YouTube channel, SiriusXM, iHeartRadio, a podcast on iTunes and Google Play, and a video channel on daveramsey.com. In 2007, the Fox Business Network launched a television show under the same title, but canceled the show in June 2010. Ramsey founded his company, The Lampo Group, Inc., in 1992 (Now called Ramsey Solutions. ), initially helping people one-on-one who were struggling with financial issues. In 1994, he hired Russ Carroll, Ramsey's lead financial counselor, and together they began teaching the first Financial Peace University classes on overhead projectors. Between 1999 and 2004, The Lampo Group grew from 18 to 105 team members. There are currently over 500 team members. Ramsey runs his business completely debt-free, an accomplishment he states was critical to the success of his company. Ramsey is also the creator of Financial Peace University, a biblically based training series for adults that integrates video teaching, class discussions, and small group activities. The video series lasted for 13 weeks until August 2012 when it was relaunched as a 9-week program. Some topics covered in the series are cash flow planning, investing, saving, credit, retirement, and giving. The word EntreLeadership describes the responsibilities of a small business owner as an entrepreneur (Entre) and as a leader (Leadership). EntreLeadership is also the name of a small business conference developed by Dave Ramsey. The principles presented at EntreLeadership seminars are the core principles of how Ramsey grew his company debt-free. EntreLeadership is available to small-business owners in several forms; a one-day abbreviated seminar; and a five-day master series event located in Nashville, Tenn; a multi-day Summit; and as premium online content. Ramsey also released the book titled EntreLeadership in 2011. The book rose to the New York Times Bestseller's list nearly overnight. EntreLeadership marked the fourth time Dave Ramsey has been listed on the New York Times Bestseller's list. In 2013, Ramsey and the Lampo Group launched the followup to Financial Peace University, The Legacy Journey. This course is a biblically based training series for adults lasting seven weeks focused on "what's next?" after getting out of debt and, like Financial Peace University, integrates video teaching, class discussions, and small group activities. Some topics covered in this series are a deeper look into investing, basic estate planning, purposeful living, safeguarding your legacy, and discovering the keys to generational wealth and true generosity. EveryDollar is a budgeting tool that was created by Ramsey Solutions, available online, on iOS, and Android. Users list all sources of income and they give every dollar a name for the month, based on zero-based budgeting. Ramsey supports the debt snowball method, where debtors pay off their lowest balance debt first instead of paying off their highest interest rate debt first. While this approach has been criticized by some, such as NerdWallet.com, other research such as that done by the Kellogg School of Management has found that the debt snowball method is generally effective. The article stated that the small victories give debtors motivation.A 2016 study by Harvard Business School also found people who used the snowball method to pay off their smallest account first paid down more of their debt than those who used other methods. Ramsey states that investors can get a 12% average annual return and this is the number he uses in financial analyses. Critics state that using an average annual return rate is misleading and that the compound annual growth rate is a better measurement when planning investments. Most individuals are unaware of this difference. Critics have also stated that a 12% return is unrealistic. According to the Motley Fool, following Ramsey's calculations could cause individuals to be seriously under-invested for retirement. Ramsey recommends investors to hold all their investments in stock mutual funds, with no bonds, which has been criticized as stocks are more volatile than bonds. Ramsey recommends that retirees withdraw 8% of their retirement each year. Ramsey recommends individuals buy term life insurance instead of cash value insurance or return of premium life insurance and invest the savings. The Nashville Scene has reported that Ramsey occasionally receives emails and letters containing the red-letter Bible verse: "And again I say unto you, it is easier for a camel to go through the eye of a needle, than for a rich man to enter into the kingdom of God." Ramsey interprets such communications as a rebuke of his own wealth and a call for poverty, dismissing these letters as “doctrinal nitpicking.” He instead points to Matthew 25:13-30 and the good Samaritan as examples of being a good steward of money, and asks rhetorically how broke people can help the poor. In 2010, Ramsey received criticism on social media sites for building a large and lavish home. He responded that the cost of the home was paid in cash, represented a very low percentage of his net worth, and had already been used to host many fundraisers for ministries, charities and community causes.